Two tiny golden hearts sprinkled with pavé diamonds hang from a delicate gold chain. 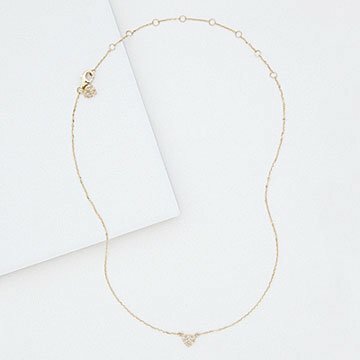 Two tiny golden hearts sprinkled with pavé diamonds hang from the delicate gold chain of Lee Ann Jones's sweet statement necklace. Nestled at the wearer's throat and at the nape, they send a subtly sparkling message of love. Adjustable from 14"-18", the necklace can be worn at choker length or longer, either layered or on its own. A understated eyecatcher, it makes for an elegantly heartfelt gift for a wedding, anniversary, or any occasion where love is the centerpiece. Handmade in Texas. Check out our interview with Lee Ann and lay eyes on her canine companion on the blog. Wife, mother, and former lawyer Lee Ann Jones was approached by people who wanted to purchase her one-of-a-kind, limited-edition jewelry pieces from the moment she began designing and making them. She started taking metalsmithing classes just for fun, and found herself so immersed in what she was learning that the time flew by. “When friends started wanting to buy pieces off of my neck,” she says, “I was hooked.” Her designs are influenced by vintage and antique pieces she has collected over the years, but her main source of inspiration is “watching the women I know... they are in constant movement working to earn a living, for their families and for the good of others.” First Place in the 2017 JCK Tucson UncommonGoods Design Challenge was just one of the awards she won a mere year after she introduced her first fine jewelry collection. Each piece of our jewelry is hand-crafted and therefore, delicate. Avoid getting wet or submerging in water. Please also avoid direct contact with chemicals such as perfume, house hold cleaners, detergent, and lotion.